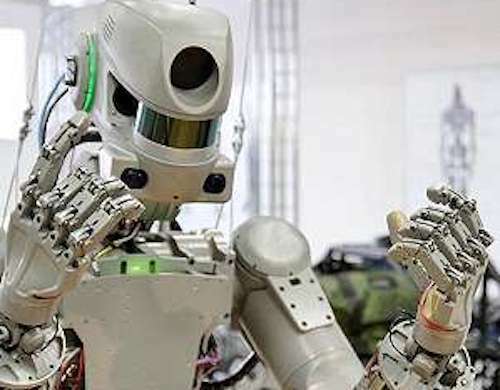 F.E.D.O.R., which stands for Final Experimental Demonstration Object Research is the first Russian humanoid robot, created within the framework of the Foundation of Advanced Studies. The robot is designed to replace humans in high-risk situations for example, in rescue operations and in space. Humanoid robot F.E.D.O.R., may become self-learning in the future. "It is interesting to develop the system from the point of view of self-learning, when it has to adapt, make attempts and look for new solutions to achieve priority tasks, as well as parallel alignment of tasks with switching to a higher priority. That's what we are working on," according to head of the information technology laboratory at the Blagoveshchensk Pedagogical Institute, Alexander Semochkin. According to the scientist, the tasks for developing software for the robot are well thought out. So systematic planning and step by step execution of new tasks is possible. "The ultimate goal of our work on robot management software is to give an anthropomorphic robot the possibility of autonomous behavior with human participation only at the stage of setting out tasks," Semochkin said. "The goal is very ambitious and complex, due to many experiments, the choice of effective methods and approaches," he added. Semochkin also noted that the operator's functions should be limited to setting out the tasks for the robot in the areas where it will be working, such as pointing out the objects it will interact with, learning to recognize them, etc. It is planned that in 2021 F.E.D.O.R. will go into orbit on the Russian next-generation Federation spacecraft. Earlier F.E.D.O.R. became the first robot in the world that managed to do the splits demonstrating a unique freedom of movement. The report explained that the flexibility of the rescue robot is necessary in order to enable it to overcome a variety of obstacles. In the summer of 2017 F.E.D.O.R. also became capable of shooting using both of his arms. Training to shoot was a way of teaching the robot to instantaneously prioritize targets and make decisions.